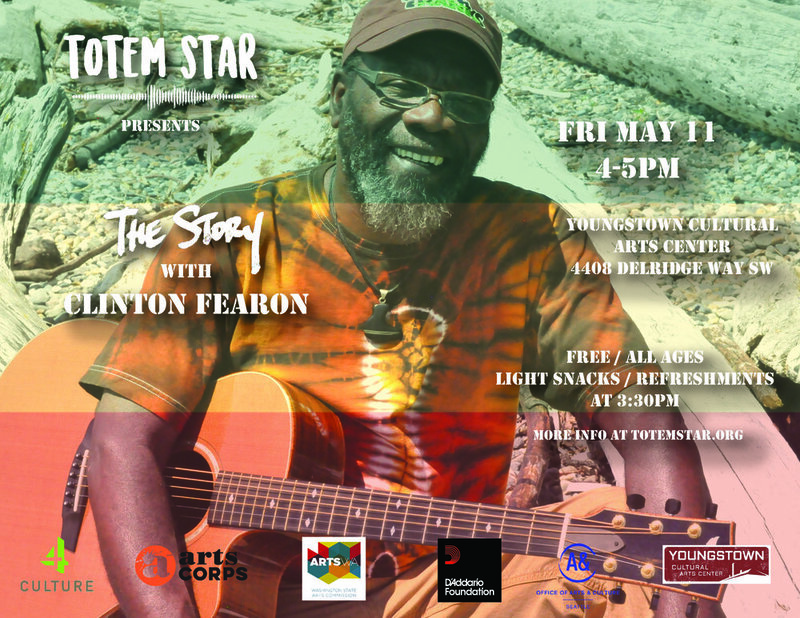 Join Totem Star @ The Station for our Spring Open Mic! This event runs from 8-10pm, right after The Station closes it's normal hours. The party continues! This event is FREE / ALL AGES. If you haven't already, visit The Station in Beacon Hill! It's a dope place for the community to meet and serves delicious food & drink. For the fourteenth installment of All Access Fridays, Ace Wilson will be leading a Vocal Technique Workshop to help you improve your singing and find your voice. Ace Wilson is a queer and transgender artist of color who currently focuses on video media after realizing the true power that video media has on influencing the world. In high school, Ace was really into watching documentaries, especially the ones about space where that omnipresent white man voice is like "As we travel, billions of light years across the galaxy, we will discover what humans call a galactic star cluster." Ace used to thrive off those type of documentaries. Little did they know that their fascination with documentaries as a piece of art and an educational tool would lead them to become a videographer as a profession. Ace is grateful to have had many opportunities to get hands-on skills and experience with video, with the most recent and profound opportunity, becoming a KEXP intern. They are also a musician, so naturally they've been sucked into the world of music videos. Ace realized that they wanted to create music videos artist after they noticed that they spend a lot more time watching music videos compared to the amount time watching films. They love music videos because of their flexibility. For example, music videos can be super clean and to the point or experimental and edgy, it's really about what the musician wants to convey. Ace also appreciates the fact that music videos can leave emotional impact on the viewer in such a short amount of time. Ace is excited to share their knowledge with you so that you can sculpt your music videos into what you want them to be. Winter Magic is coming! Join us on December 7, 2018 for our fifth annual end-of-year artist showcase hosted by Mirabai Kukathas! Featuring a stellar lineup of select Totem Star artists, this not-to-be-missed spectacular is all ages and free to the general public. Dinner will be served. Doors at 5:30pm. For the thirteenth installment of All Access Fridays, Amy LP will be leading a Vocal Technique Workshop to help you improve your singing and find your voice. Amy LP is a multimedia artist, audio engineer, vocalist, and teaching artist who got started on her artistic journey through Arts Corps’ All Access program 10 years ago. She is currently Arts Corps’ Media & Communications Manager, with the honor of being able to take photos and produce videos capturing the unique stories of young artists and changemakers. She is constantly inspired by the young artists she gets to work with and has recently started writing some fresh songs after a long hiatus. Teodros is also currently active as a DJ on KEXP 90.3 FM in Seattle. For the eleventh installment of All Access Fridays, Sharmaine will be leading a Songwriting Workshop to help you create ideas for your own original tunes. Join youth leaders from Totem Star, KEXP, The Vera Project, 206 Zulu, the Museum of Pop Culture's The Residency, and Seattle Theatre Groupfor the first City of Music Open Mic! The open mic will be from 7-9 PM—sign up begins at 6:30. This event is free and all ages, and supported by the Seattle Music Commission. Totem Star presents The Spotlight, our first annual fundraiser dinner and show. Featuring an amazing feast by celebrated chefs from our community and uplifting performances by Totem Star recording artists, 100% of funds raised at The Spotlight will help keep the doors to the studio and the stage open for our young people. Totem Star is proud to present the 4th Annual Summer Kickoff youth arts showcase to highlight select artists who have been putting in hard work of in The Studio or on The Stage. This will also be the "Respect The Vibez" Official Mixtape Release Party, made possible through a partnership with Arts Corps and Youth Speaks Seattle. It all goes down on Friday June 15 from 6-8pm at Youngstown Cultural Arts Center. As always the event is all ages. Admission is a $10 suggested donation but no one will be turned away for lack of funds. Summer Kickoff is possible thanks to partnerships with Youth Speaks Seattle, Arts Corps, the Delridge Neighborhood Development Association, 4Culture, the Seattle Office of Arts & Culture, ArtsWA, the U.S. Bank Foundation, and the D'Addario Foundation . For the tenth installment of All Access Fridays, Ace Wilson will be leading Part 2 of a Music Video Workshop to guide through the basics and help you create ideas for your own music video. 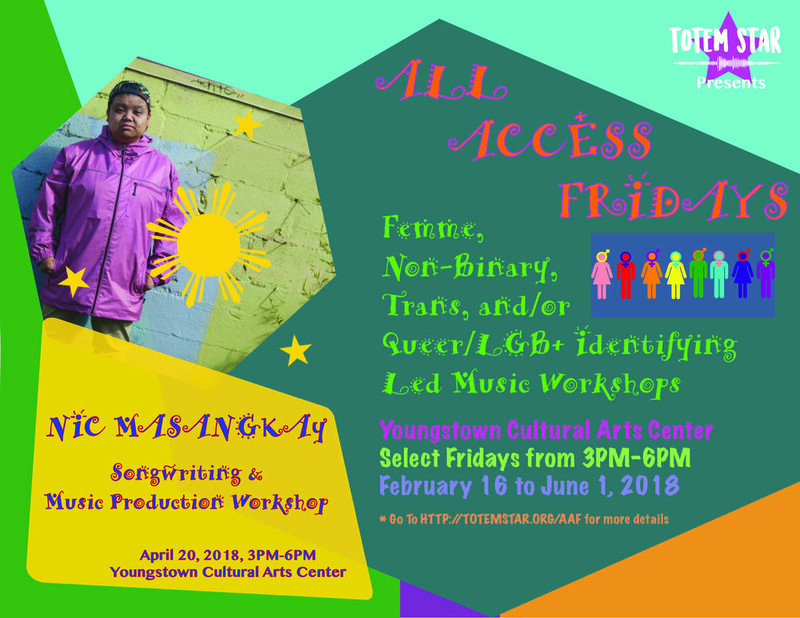 All Access Fridays is a new pilot series of music workshops led by femme, non-binary, trans, and/or queer/LGB+ identifying teaching artists. Those that identify as femme, non-binary, trans, and/or queer/LGB+ are highly encouraged to attend. Please spread the word to all that you may think could benefit from this event. 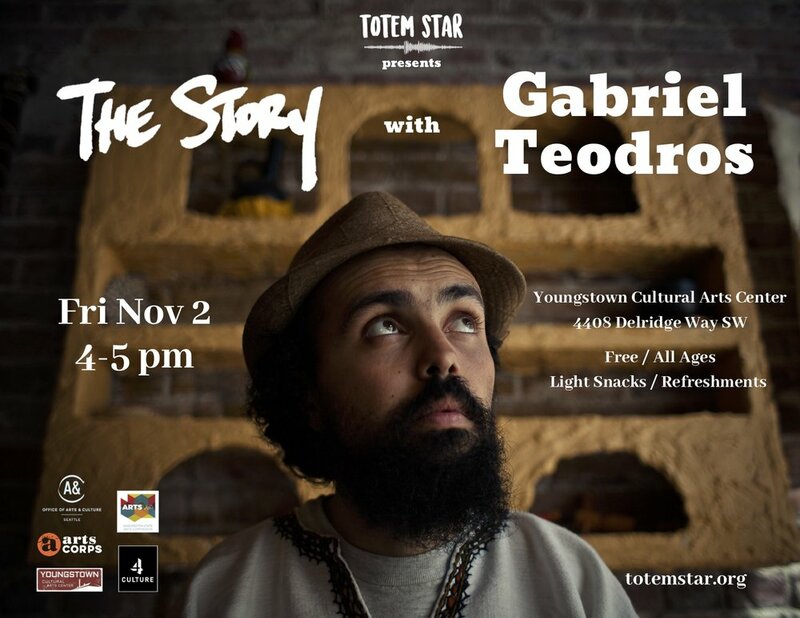 Workshops will take place on select Fridays in Winter and Spring 2018 in the Totem Star studio at Youngstown Cultural Arts Center in West Seattle. This event is free and open to all young people. Totem Star artists kidLIO, Zoë Roberts, King Cobb & Theomatic, Jawzilla, Amy Hall, and special guest host Mirabai Kukathas will be performing at The Vera Project from 1PM-2PM on Sunday, May 27th 2018 as part of the 47th Annual Northwest Folklife Festival. 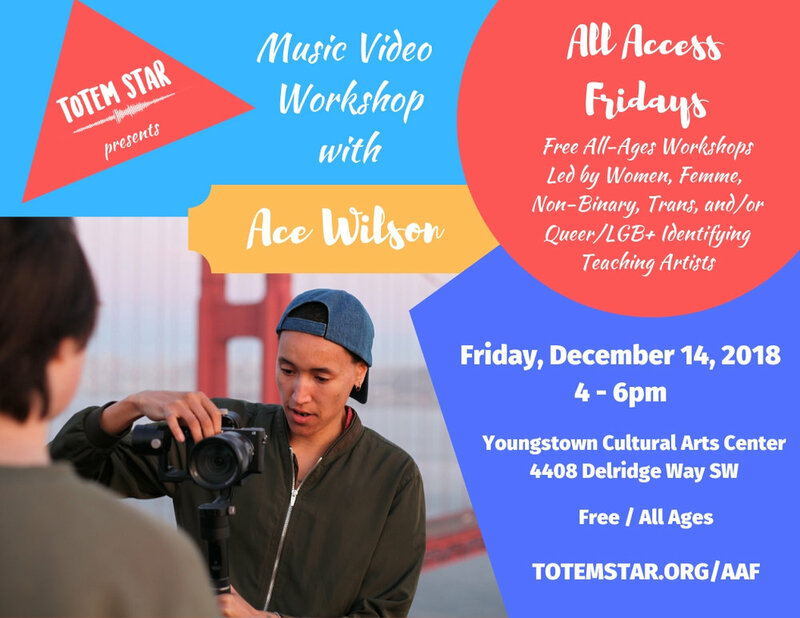 For the ninth installment of All Access Fridays, Ace Wilson will be leading a Music Video Workshop to guide through the basics and help you create ideas for your own music video. Born in Jamaica, Clinton Fearon became the bassist, vocalist and lyricist of the mythic Gladiators at the age of 19. He was also a session musician for Coxsone Dodd at Studio One and Lee ‘Scratch’ Perry’s at Black Ark in the 70s, two of the main producers on the island at this time. There Clinton composed some everlasting bass lines for well-known artists like Yabby You, Jimmy Riley, Max Romeo, Junior Byles and many others. After leaving Jamaica in 1987, Clinton Fearon started a new career in Seattle. Him and some of the musicians of The Gladiators took advantage of the extra time remaining on their visa, at the end of the US tour, to started a band in the Northwest: The Defenders. The band built a nice following in the area but split after five years. Clinton Fearon finally formed his own band in the mid 90s in Seattle with local musicians: Boogie Brown Band. Clinton Fearon recorded eight albums with Boogie Brown Band and tour with them in the Pacific Northwest and Europe intensively, but also other places in the US and South America. “My music is roots reggae from the island of Jamaica. I grew up deep in the hills, up in St. Catherine, surrounded by nature, beauty and hard work. Even as a child, I knew I wanted to be a musician and began my career singing in church and at school, and eventually built my own guitar! As a teenager, my journeys took me to Kingston where I met many musicians and began writing and recording music. The Skatalites, Motown artists and Jamaican musicians who came before me all influenced my music. KEXP, Starbucks, and STG present Little Big Show featuring Nada Surf & Chris Staples on Wednesday, May 9th at 8pm at the Neptune Theatre. 100% of purchase price benefits Totem Star! Purchase tickets here. Totem Star artists Sharmaine, King Cobb, and Theomatic will be performing live at the Seattle Art Museum Teen Night Out on May 4, 2017 from 7-10PM. This event is FREE to all high-school aged teens. RSVP on Facebook. For the eighth installment of All Access Fridays, Carlynn Newhouse will provide 1-on-1 30-minute Writing & Performance Workshops to help you practice your writing and performance technique with immediate feedback and tips from Carlynn. Make sure to bring some material to perform to receive feedback and guidance. Take some time to practice beforehand to ensure you are bringing your best. https://www.schedulicity.com/scheduling/TSX736/classes and click on "Writing & Performance Workshop with Carlynn Newhouse." Choose a 30-minute slot. Carlynn Newhouse is an African American poet, activist, actress, emcee, and performer. She is the 2015, 2017, and 2018 Youth Speaks Seattle Grand Slam Champion and competed in the Brave New Voices poetry festival in years 2015-2017. Carlynn has performed at well known venues such as Seattle Town Hall, Bumbershoot, the Kennedy Center, and others. She writes about love, loss, community, race, the Black Lives Matter movement, faith, mental health, gender, and the life experiences that made her who she is today. She believes poetry is a form of activism and tool for raising awareness in hopes of making the world a safer space. For the seventh installment of All Access Fridays, sign up for a 30-minute individual vocal session with Amy Lp. Bring some materials you’re working on and together we’ll identify areas where you can strengthen your voice to build a more powerful sound. The session will be tailored to your unique voice and goals. All levels from beginners to advanced performers are welcome! https://www.schedulicity.com/scheduling/TSX736/classes and click on "Vocal Workshop with Amy LP." Choose a slot. Amy Lp is an audio engineer, vocalist, videographer, photographer, and multimedia teaching artist. She has produced and taught an array of audio education programs in Seattle, is the Board President at The Vera Project, and a founder of Womxn's Creative Industries Meet Up – an all-ages community that inspires and connects current and aspiring media makers. Check her music out at amylp.com. Join us for the sixth installment of All Access Fridays featuring Nic Masangkay who will lead a songwriting & music production workshop. Come in and workshop your songs and beats with Nic and the rest of the group. The session will end with a jam session where the group will make a song from scratch. Nic Masangkay is a 25-year-old, multiply-marginalized poet, music producer, and singer-songwriter based in Seattle. With poetry Buzzfeed claims “will leave you speechless” and music the Seattle Times reports is "synth-pop with overlaid vocals in the style of Reggie Watts," Nic is incredibly grateful that anybody wants to listen to the art that they create to survive. 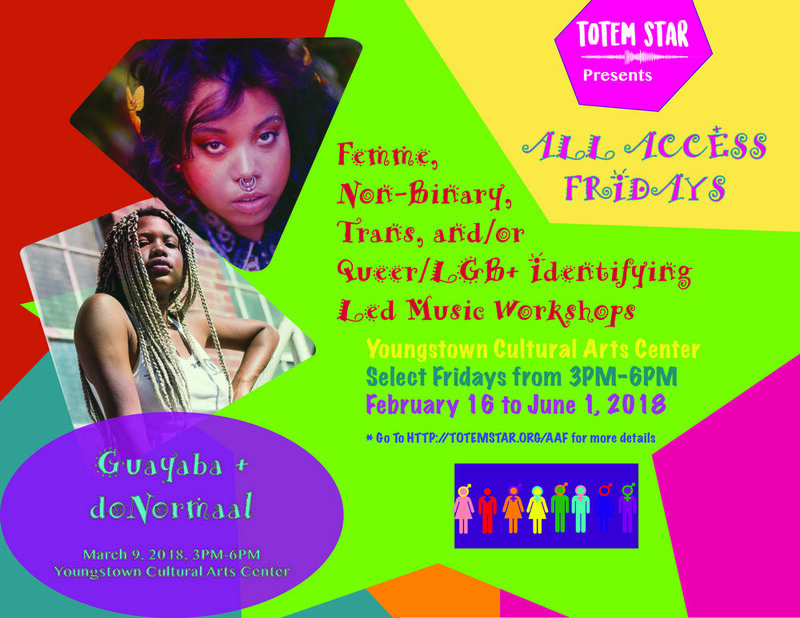 All Access Fridays is a new pilot series of music workshops led by femme, non-binary, trans, and/or queer/LGB+ identifying teaching artists. Those that identify as femme, non-binary, trans, and/or queer/LGB+ are highly encouraged to attend. Please spread the word to young people that you may think could benefit from this workshop. Workshops will take place on select Fridays in Winter and Spring 2018 in the Totem Star studio at Youngstown Cultural Arts Center in West Seattle. This series is free and open to all young people. Carlynn Newhouse is an African American poet, activist, actress, emcee, and performer. She is the 2015 and 2017 Youth Speaks Seattle Grand Slam Champion and competed in the Brave New Voices poetry festival in years 2015-2017. Carlynn has performed at well known venues such as Seattle Town Hall, Bumbershoot, the Kennedy Center, and others. She writes about love, loss, community, race, the Black Lives Matter movement, faith, mental health, gender, and the life experiences that made her who she is today. She believes poetry is a form of activism and tool for raising awareness in hopes of making the world a safer space. Performers! Practice your performance technique while learning new ways to increase your stage presence. Make sure to bring some material to perform to receive feedback and guidance. Take some time to practice beforehand to ensure you are bringing your best. Amy Lp is an audio engineer, vocalist, videographer, photographer, and multimedia teaching artist. She has produced and taught an array of audio education programs in Seattle, is the Board President at The Vera Project, and a founder of Womxn’s Creative Industries Meet Up – an all-ages community that inspires and connects current and aspiring media makers. Vocalists! Hone your technique and learn some breathing exercises to build a more powerful voice. Practice singing your favorite songs and receive feedback for improving your voice in a safe, supportive environment. Join us for the third installment of All Access Fridays x The Story featuring Guayaba & doNormaal who will discuss their own personal stories in how they navigate the music industry, their creative process, and more. Those that identify as femme, non-binary, trans, and/or queer/LGB+ are highly encouraged to attend. Please spread the word to young people that you may think could benefit from this workshop. All Access Fridays is a new pilot series of music workshops led by femme, non-binary, trans, and/or queer/LGB+ identifying teaching artists. 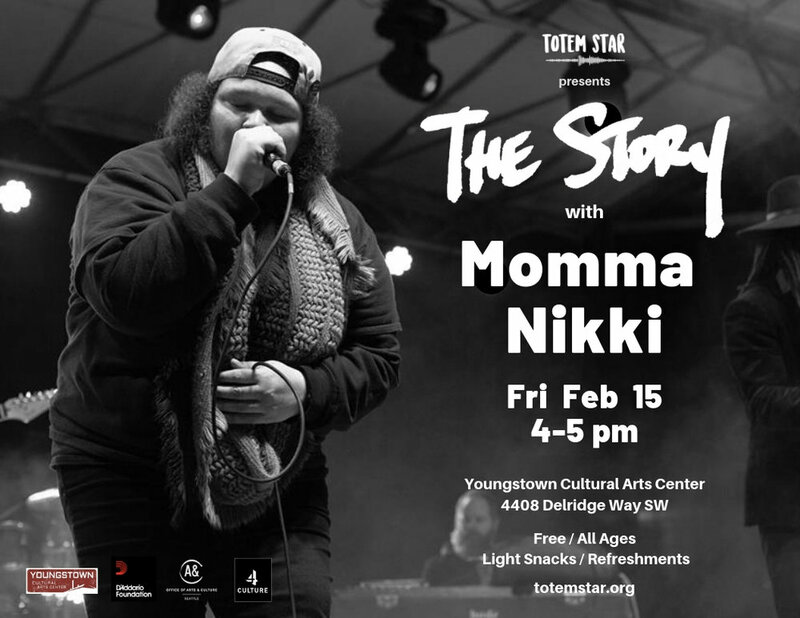 Workshops will take place on select Fridays in Winter and Spring 2018 in the Totem Star studio at Youngstown Cultural Arts Center in West Seattle. This series is free and open to all young people. Join us for the second installment of All Access Fridays featuring Julz Ilang-Bulan & Nic Masangkay who will lead a songwriting & music production workshop. Those that identify as femme, non-binary, trans, and/or queer/LGB+ are highly encouraged to attend. Please spread the word to young people that you may think could benefit from this workshop. Julz Ilang-Bulan is a maker of sorts, weaving sounds, shapes, and colors into musical and visual stories. As a storyteller and kultural practitioner, Julz draws inspiration from their Ilokano ancestry and centers on healing, love, grief, diaspora, memory, transformation, and the ocean. Julz believes that storytelling is a sacred way to authentically witness and connect with one another. Join us for the first installment of All Access Fridays featuring SassyBlack. Those that identify as femme, non-binary, trans, and/or queer/LGB+ are highly encouraged to attend. SassyBlack is space-aged singer, songwriter, and producer. This Goddess of "electronic psychedelic soul" and "hologram funk" explores the concepts of sound through deep compositions. With roots in classical and jazz, her voice is often compared to Ella Fitzgerald, Sarah Vaughan, Erykah Badu, and Georgia Anne Muldrow. She has gained attention from Okayplayer, Afropunk, The Fader, and Pitchfork. Young poets, get ready! Young musicians, get ready! Young lyricists, get ready! 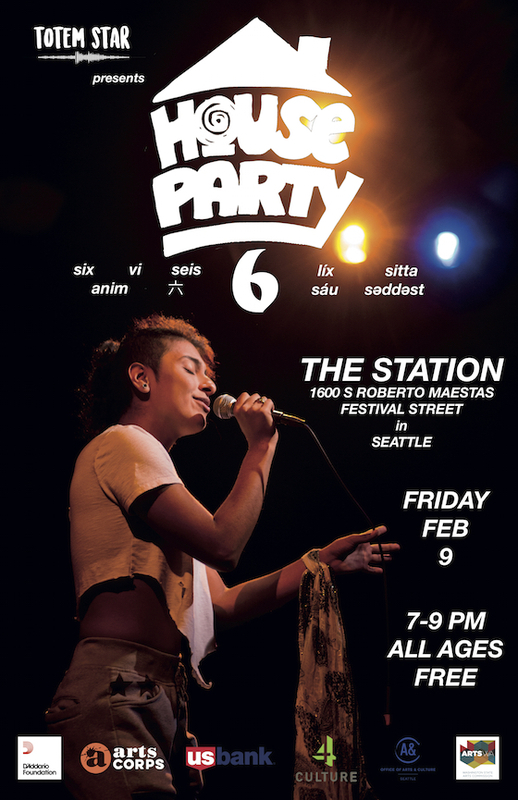 Totem Star will be hosting our House Party 6 open mic at The Station in Beacon Hill on Friday, February 9th from 7-9pm. We are excited to partner with The Station, one of our favorite coffee shops/community hangouts/safe spaces in Seattle. As always, the event is all ages and is free to the general public thanks to partnerships with 4Culture, Arts Corps, the Delridge Neighborhood Development Association, the Seattle Office of Arts & Culture, ArtsWA, the U.S. Bank Foundation, and the D'Addario Foundation. Before winter break of every school year Totem Star hosts the Winter Magic youth arts showcase to highlight select artists who have been putting in work in The Studio or have performed at our House Party open mics. This year’s event goes down on Friday December 1 from 6-8pm at Youngstown Cultural Arts Center. 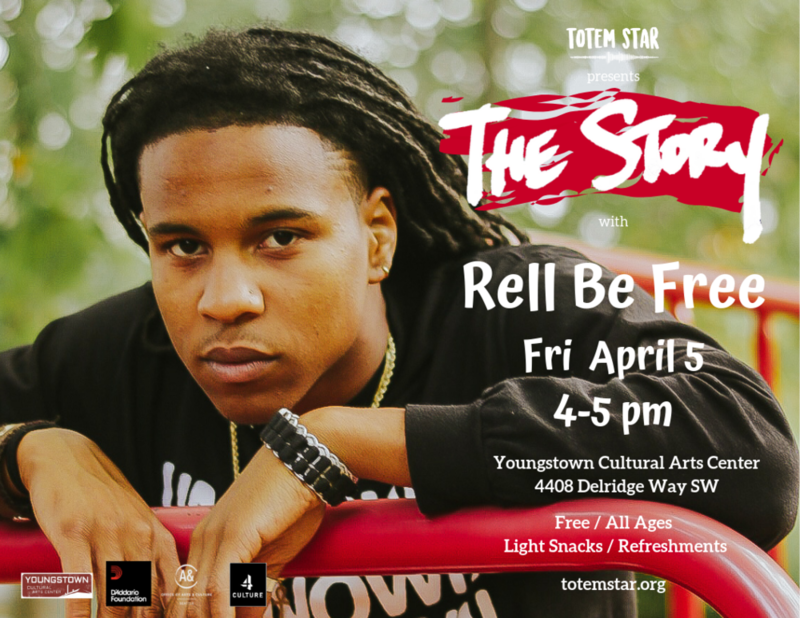 As always, the event is all ages and is free to the general public thanks to partnerships with 4Culture, Arts Corps, the Delridge Neighborhood Development Association, the Seattle Office of Arts & Culture, ArtsWA, the U.S. Bank Foundation, and the D'Addario Foundation . Nikkita Oliver is an organizer, educator, teaching-artist, and attorney who has contributed to the vibrancy of our city through her art and advocacy. After graduating from Seattle Pacific University, she earned her Master’s of Education and Juris Doctorate concurrently from the University of Washington. She has spent the years since serving Seattleites as a teacher and pro-bono lawyer. And as a singer and poet, she's rocked many a stage. Whether it's inspiring our young in the classroom, partnering with educators and other working people, or fighting against unjust policies that hurt our residents, Nikkita has made it her life’s work to ensure Seattle leads our nation with progressive policies and transformative structures. Join us on October 20, 2017 for The Story with Nikkita Oliver. As always, it's all ages and free to the general public. Light snacks and refreshments will be provided.